Product prices and availability are accurate as of 2019-04-11 14:39:42 EDT and are subject to change. Any price and availability information displayed on http://www.amazon.com/ at the time of purchase will apply to the purchase of this product. Camo Form is ideal for wrapping shotguns & rifles, bows, scopes, binoculars, flashlights, outboard motors, oars, dog collars and other gear. This heavy duty stretch fabric wrap clings to itself as it is wrapped around objects. It stays solidly in place and won't sag, even in wet weather. It conforms to any shape and can be cut and applied to the smallest moving parts. Camo Form leaves no sticky residue when removed. Camo Form will dramatically improve grip and insulates hands from uncomfortably hot or cold surfaces. It helps prevent slipping in the field. 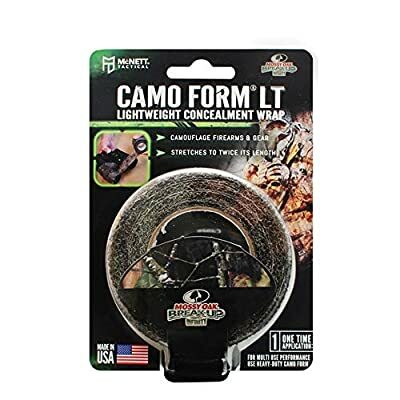 Wrap Camo Form around any piece of outdoor equipment to keep it from clanking against other objects and to reduce glare. It is washable and reusable!